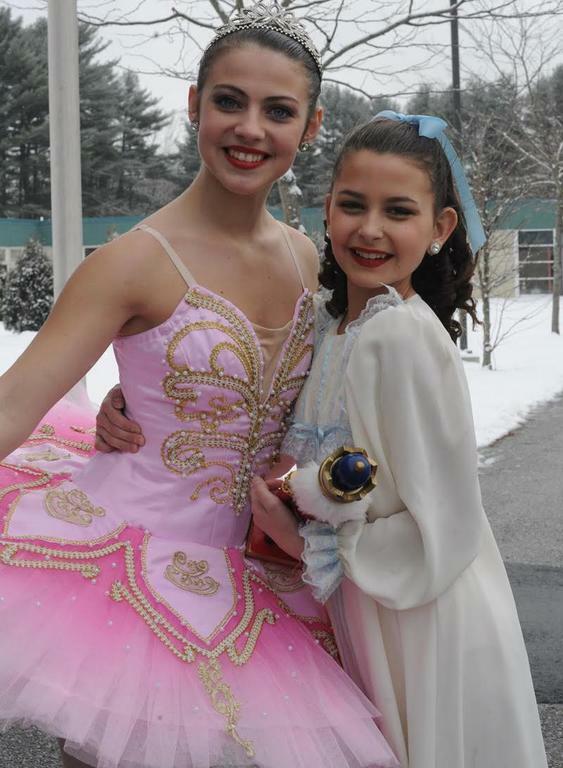 Kayleigh Bowen of Gray as the “Sugar Plum Fairy” and Taylor Pronovost of Cumbrland, performed for children in Gray and New Gloucester last week. Dancers from Studio for the Living Arts Dance Complex in Gray performed excerpts from “The Nutcracker” at the Memorial Elementary School in New Gloucester on Dec. 7. Students from the Russell Elementary School in Gray also joined in as they were provided a “Nutcracker Performance field trip” to Memorial. “The Nutcracker” performers arrived in costume and danced scenes from the holiday classic for over 300 students gathered in the cafeteria. Students sat enraptured as the dancers leapt and turned in front of them. The studio hopes that community performances like this will help to inspire some young students who may not otherwise have the opportunity to go to the theater and see the production themselves. The cast, directed by Studio for the Living Arts faculty members Elizabeth Avantaggio and Kate Smedal, is comprised of over 100 ballet dancers age 6 to adult, and it is made up of students from the studio in Gray, as well as local dancers who audition for parts. This year’s full length “Nutcracker” production took place on the stage at the Westbrook Performing Arts Center on Saturday Dec. 3. The studio is celebrating their 25th season of dance. Thank you to everyone who stopped by and donated a gift or monetary donation for the Fill The Train Christmas gift drive. On behalf of families in need this holiday season and the Caring Community of GNG, over $850 was donated, along with a truckload of toys and games. Your time, generosity and kindness at the CCGNG 1st Annual Fill The truck event is appreciated. Thanks to the Narrow Gauge Railroad for allowing us to use the train car, the committee members for organizing the event, GNGHS Community Service Club for donating their time, Gray Fire and Rescue for bringing the trucks to the event and Santa for taking time out of his busy schedule to help the CCGNG. This year money is needed to provide the basics for a merry Christmas to families in Gray and New Gloucester. Every year the CCGNG receives more applications for assistance at Christmastime than they have sponsors to adopt the families. Donors provide the much needed money to help CCGNG give food baskets to those families along with gifts for children 18 and under. There’s still time to make a donation, please send a check to CCGNG P.O. Box 1224, Gray, ME 04039. Gray Fire Rescue is the latest beneficiary of the Hannaford Helps Reusable Bag Program. For every blue reusable bag with the good karma message purchased at the Gray Hannaford during January 2017, GFR will receive $1. On Saturday Dec. 17, a breakfast will be held from 7-10 a.m. at the American Legion Post 86, 15 Lewiston Road. On Friday, Dec. 23, the Transfer Station closes at 4 p.m., the Public Library closes at 5 p.m. and the Town Office is closed all day. On Saturday, Dec. 24, the Public Library and Town Office is closed while the Transfer Station closes at 11 a.m. On Sunday, Dec. 25, and Monday, Dec. 26, all town facilities are closed. Dog licenses for 2017 are available for purchase at the Gray Town Office or online. All dogs 6 months or older must be registered by Dec. 31 each year. Bring your dog’s current rabies certificate with you at the time of registration. Fees for neutered/spayed dogs are $6 per year. Non-neutered/non-spayed dogs are $11 per year. A $25 late fee will be charged after Jan. 31. If you had a dog that is no longr in your possession, contact the Town Office at 657-3339. To register online you will need a credit card license/tag number (renewals only), State of Maine Rabies certificate, veterinarian’s name and phone number and a spay or neuter certificate if your dog has been fixed. For more information, go to www.graymaine.org, vist the Gray Town Office or call 657-3339. Attend a movie and enjoy a tasty snack in the Gray Public Library’s theater. Free movies showing soon are: “The Great Gilly Hopkins” (PG), Saturday, Dec. 17, 10:30 a.m.; “Elf” (PG), Saturday, Dec. 17, 1 p.m. ; “A Christmas Carol,” Tuesday, Dec. 20, 1 p.m.; “Sully” (PG-13), Tuesday, Dec. 20, at 6:30 p.m.; “Scrooged” (PG), Dec. 22, 1 p.m. ; “Pete’s Dragon” (PG), Friday, Dec. 23, 10:30 a.m.; “A Christmas Story” (PG), 1 p.m.; “The B.F.G.” (PG), Tuesday, Dec. 27, 10:30 a.m.; “Sully” (PG-13), Tuesday, Dec. 27, 1 p.m.; “Snowden” (R), Tuesday, Dec. 27, 6:30 p.m.; “Storks (PG), Wednesday, Dec. 28, 1 p.m.; “The Secret Life of Pets” (PG), Thursday, Dec. 29, 10:30 a.m.; “Southside With You,” (PG-13), Thursday, Dec. 29, 1 p.m.
For more information, call 657-4110 or go to www.gray.lib.me.us. The library is located at 5 Hancock St.
Total Body Conditioning, for ages 15-99, will be held from 6:30 p.m. on Tuesdays, Dec. 20 through Jan. 31, at the Newbegin Community Center Gym. Pparticipants will hit multiple muscle groups and burn calories in a workout that is designed to strengthen the cardiovascular system, tone muscles and boost balance, flexibility and endurance. Nerf Night – On Friday, Dec. 16, walls and barriers will be set up for team battles and organized chaos. Bring your Nerf gun (one that shoots standard darts), eye protection and a water bottle. All darts will be supplied. Prizes will be awarded for some of the contests. Grades 3 and 4, 6-7:30 p.m. The fee is $15 for the session at Newbegin Gym. Parents welcome to watch on stage. Clean Family Eating 101 – This two-hour workshop on Saturday, Dec. 17, from noon to 2 p.m. , upstairs at the Henry Pennell Municipal Complex, will offer instruction on how to beat the statistics of living without diabetes, cancer and other inflammatory diseases. This workshop will teach you how to stay on budget, save time preparing food, boost your immune system, gain energy and lose weight. Instructor Deanna McCormack will be providing sample foods. Dancers from Studio for the Living Arts Dance ComplexCast members perform the popular “Snow Scene” from “The Nutcracker” for young students at Russell Elementary School. The space under the Christmas tree at Gray Town Hall is filling with Shoebox donations. The Fill the Train event in Gray will provide gifts for many families this holiday season.